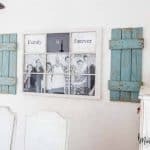 Complete tutorial on how to make a gallery wall with family photos with everything you need to know from layout to choosing frames, pictures, words or inspiration. 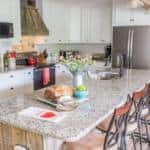 We have transformed several areas of our home in the last three months and I want to start out sharing the one that tickles me the most. 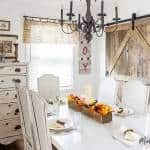 When I first started transforming our home a few years ago I was enthralled by Pinterest and created too many boards to count. 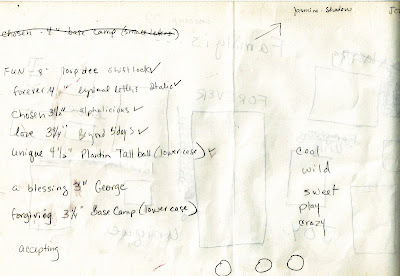 I still use it to organize my ideas but the inspiration for my project is found here. 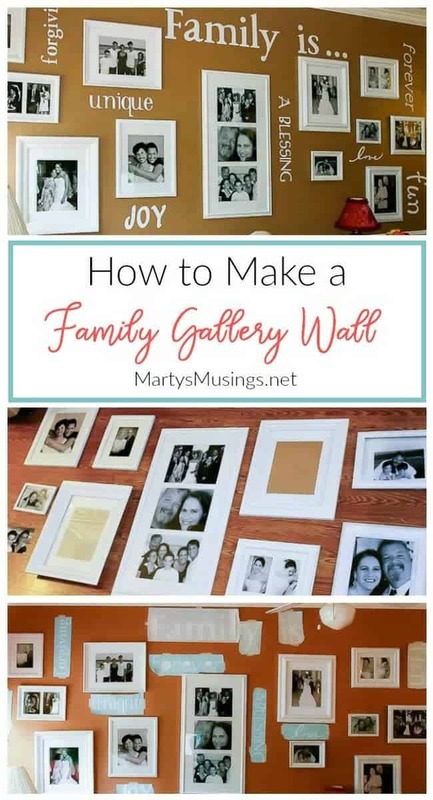 I was totally enthralled with the details on how to make a gallery wall in our den. 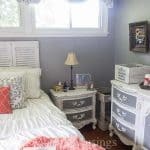 Since I am a yard saler/cheapskate thrifter I began by collecting frames from around the house and up in my personal store, otherwise known as the attic. 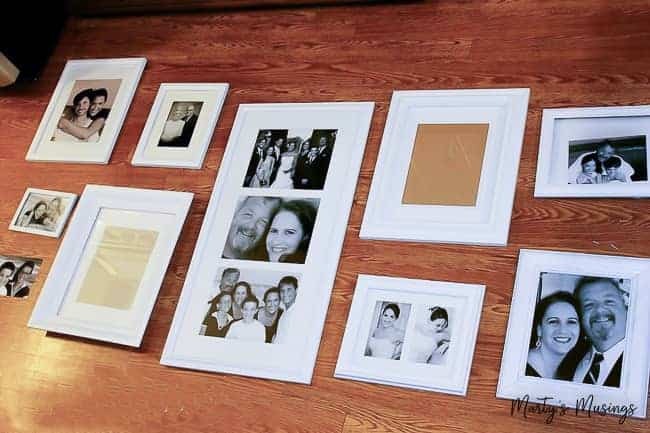 I had no idea how I would do the arrangement but I got enough frames to use 4×6, 5×7 and 8×10 black and white pictures. Whenever Walgreens had a sale on prints (or a free offer) I would order more black and whites in various sizes. I did NOT think through where everything would go and in which frame ahead of time. I just ordered pictures I liked or ones that would give me some variety. 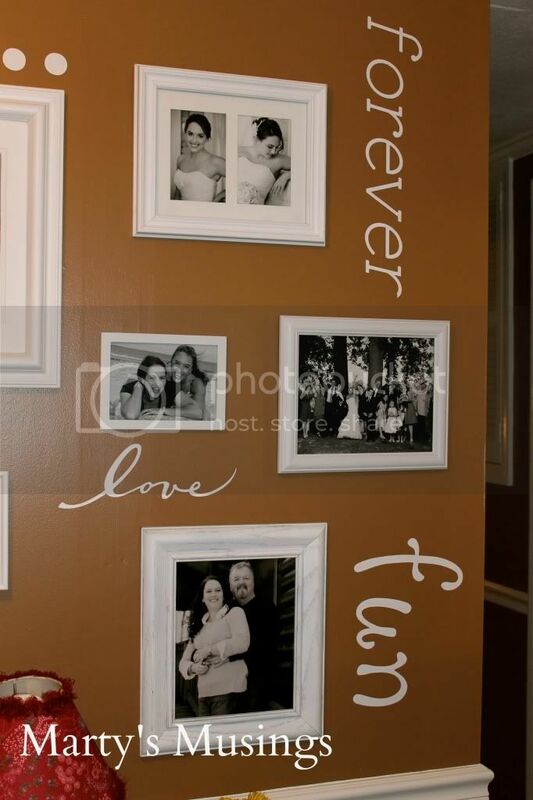 My husband spray painted the frames with an aerosol primer and white spray paint. He even sprayed some of the mats. The additional mats I bought half off at Michael’s. This process of ordering pictures and gathering the frames was time consuming, lasting over a few weeks. It was a little tedious. Okay, very tedious. 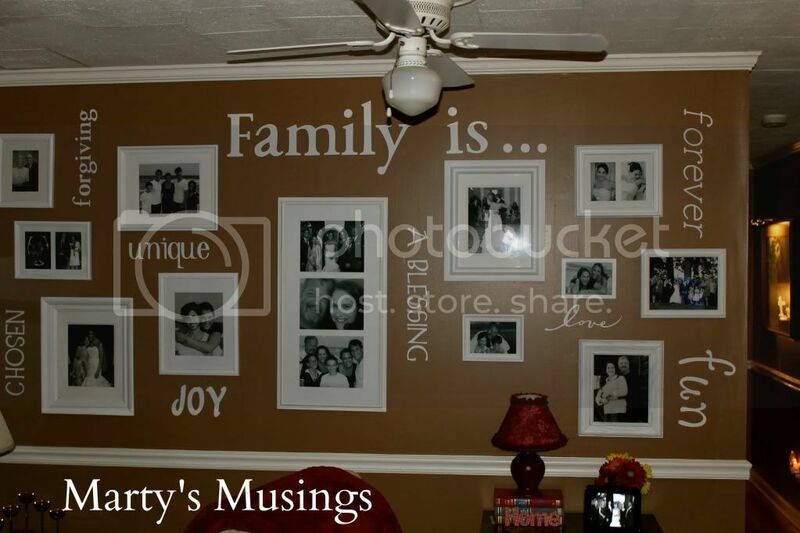 I then started randomly inserting pics in frames and created an arrangement on the kitchen floor where I could get an idea what I still needed and which frames I would be working with. 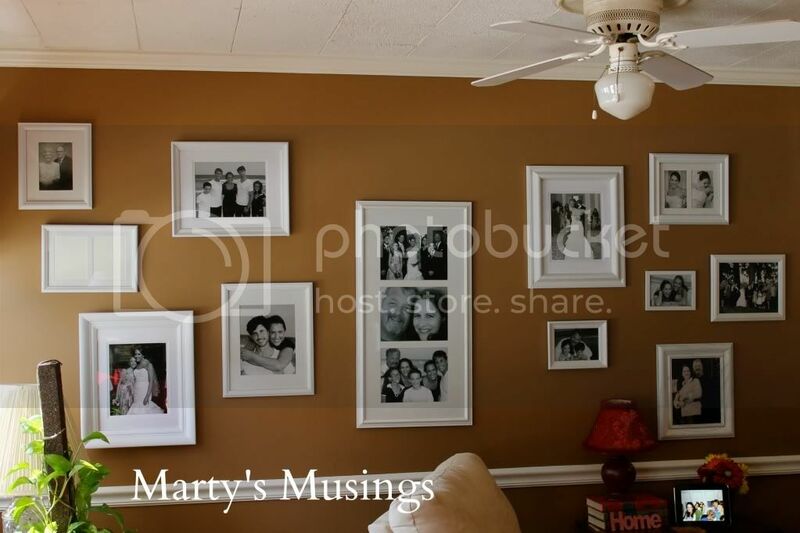 For this wall the most important part was deciding on the center frame which contained three 8×10’s. My husband centered this on the wall and just started randomly hanging the rest. There are certainly more precise ways to go about this but we knew we didn’t want a symmetrical grouping. 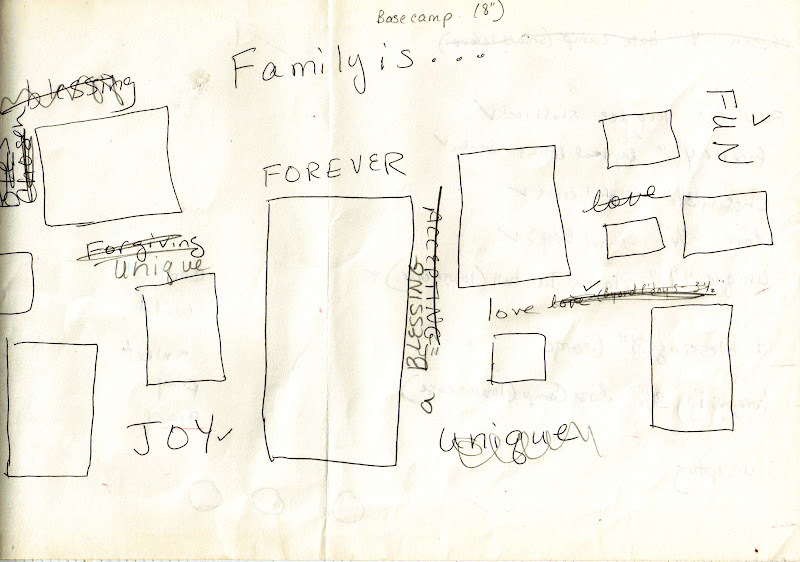 On a sheet of paper I laid out the “family is” phrase and loosely diagrammed the frames. 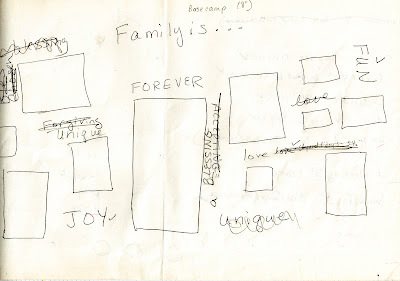 I enlisted my family to give me words they felt described our family. I then sketched the words around the frames. 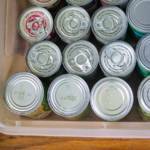 (None of this was done in precise measurements….obviously.) You can tell by the sketch that I later moved words around. 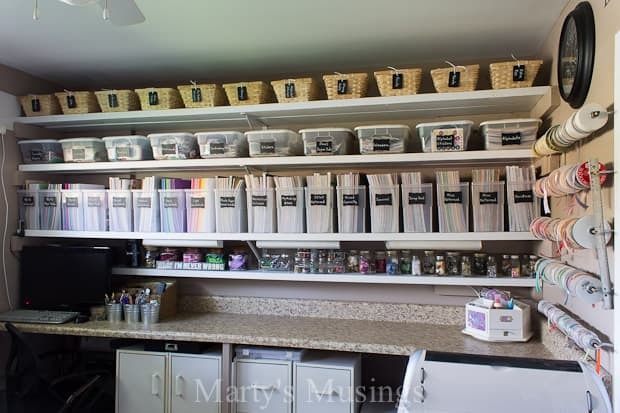 As the weeks passed while I was working on this project I was also buying white vinyl for my Cricut, using coupons, of course, from various craft stores around town. The part I dreaded most and kept putting off was the final step of cutting the words out with my Cricut Expression. Using the 12×24 cutting mat, I chose one word and font (cartridge) at a time. I measured in between the frames to get an idea of the size I would need. However, the size is relative when using the Cricut so I cut out each word from cardstock first to make sure they would fit in the allotted space. 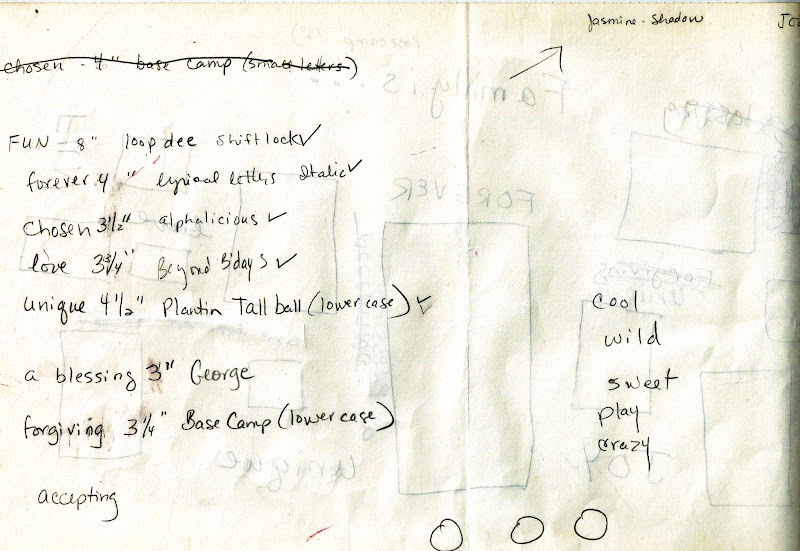 I also kept a list of which fonts and sizes I used so I wouldn’t duplicate them. 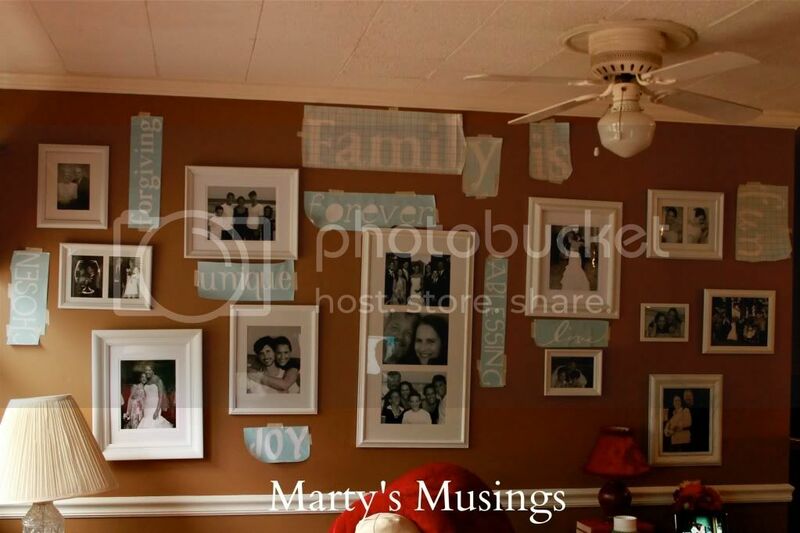 Next I used masking tape to align the words on the wall as I was deciding where to place them. I loved the flexibility of moving the words around to find the best look. 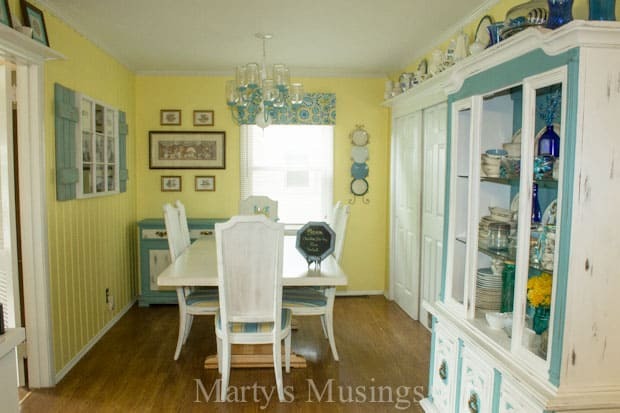 I let my husband do the actual work of attaching the vinyl since he is much more of a perfectionist than I am and is also better at detail work. He found this little gadget that was an amazing help. 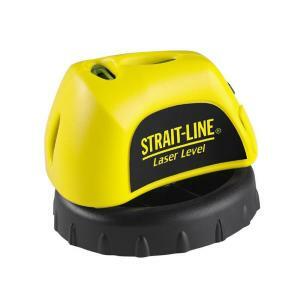 It’s a laser level that mounts to the wall with removable adhesive tape and projects up to a 15 ft. laser line. Lining up the words….easy peasy. You can find it here . It looks like a bug on the wall. Peeling the transfer paper off the vinyl word. My husband using the bone folder to attach the vinyl to the wall. The finished product! I had such a hard time photographing this wall without a glare. Better shot in the daylight. 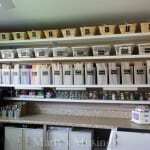 Includes laser level, frames, mats, black and white photos, spray paint and primer, vinyl and transfer paper. 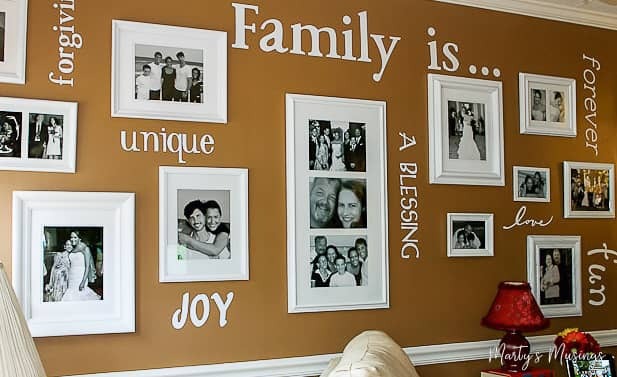 Now that you know how to make a gallery wall, is there a room in your home that is perfect for one? 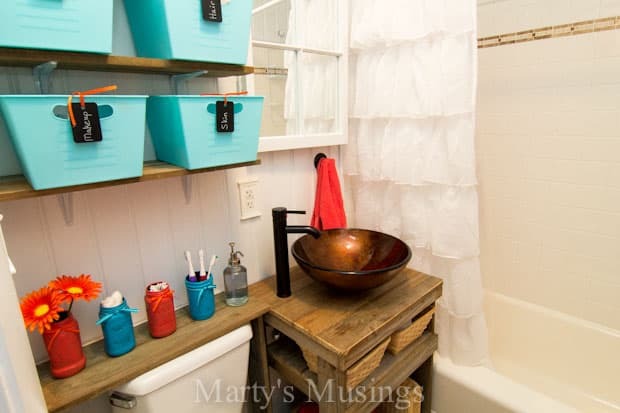 Want to see more of our DIY projects? Just click on the picture to be taken directly to the post! Absolutely beautiful and so stunning. I’ve never heard of a Cricut, unless it is the machine in a teacher;s room that cuts letters. But then how do you get the vinyl to stick to the yardstick. I’m not sure what hubby was doing with the squares (vinyl?) over the letters. Whatever you did it is spectacular. Love it!! It turned out beautiful!! Thanks, Crystal! It’s still one of my favorite projects!